In our discussion of dalak דלק - "burn", I didn't mention one derivative - madlek מדלק. That's because you've probably never heard of it. It was Ben Yehuda's attempt to come up with a Hebrew term for "match" - as in a match used to start a fire. In his dictionary Ben Yehuda writes that the word is "used in Hebrew speech in the Land of Israel, and has already been used in newspapers and books." However, one of the changes from Hebrew of the Haskala to modern Hebrew was the replacement of two word phrases with single word ones (Reuven Sivan lists 57 of them in his essay "חליפות ותמורות בלשון ימינו" in Leshonenu L'Am 31:9-10, 1980). Other one word suggestions (besides madlek and tzita) included madlik מדליק, mav'er מבער, and alit אלית (by Eliahu Sapir, based on the Talmudic phrase in Tamid 29a - מציתים את האליתא). But the word that stuck was gafrur גפרור, gofrit. 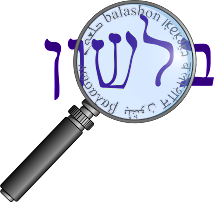 Sivan claims the word was coined by Mendele, and used in his revised 1909 edition of his book HaEmek HaBacha. I found gafrur used (again, without explanation) in this 1905 article in the newspaper HaZman. It is not clear to me if Mendele used, and perhaps popularized a word coined by someone else, or if the article in HaZman was using a word Mendele had coined, but Sivan only noted the later revision of the earlier book as an example. Klein suggests that gafrur was coined "under the semantic influence of Yiddish שוועבעלע (=match), derived from שוועבל (=sulphur), or of German Schwefelholzchen (= lucifer match) from Schwefel (=sulphur)." This similarity might have helped its popularity.